Have a great Halloween everyone! And keep in mind that I fully intend to revive Haunt on the Hill in the future when time and space allows. This will come with a new website as well, as I’m well aware that this one is mega outdated and not mobile friendly. Not sure when this will be, but it will! Happy Halloween from Haunt on the Hill and Panic on Pendrith! You can find out more about this years display at www.benevents.ca but so you know the display is at 153 Pendrith Street, which is near Bloor and Ossington. Have a spooky Halloween! Stay safe and get lots of cavities or something like that! I look forward to seeing some of you at Panic on Pendrith this evening (I will be Lydia Deetz and my husband will be Beetlejuice). Come say hi! Once again, enjoy this video of the poem that The Nightmare Before Christmas was based on. I know I posted it last year, but I’m posting it again because it’s awesome! I cannot move my legs. That’s the quick version. Oh, you want more than that? Ok fine. Halloween was a mix of things. Mainly it was awesome, but there were some hiccups along the way. Like when I accidentally knocked my Oogie Boogie pumpkin off its stand and he fell and broke. Or when I lost the remote for one of the projectors temporarily. On the plus side, it was incredible weather right up until around 9pm. We managed to raise a lot of money for charity and everyone on Pendrith and the surrounding streets were thrilled with the display. Thriller was also one of the new songs the Trio of Singing Pumpkins performed this year! The main set-up was amazingly fast! That’s what happens when Halloween is on a Saturday and you get people to help you. I actually had time left to work on my costume properly! 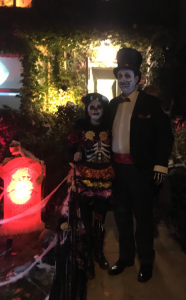 As you can see, my husband and I were a Day of the Dead bride and groom. It was one of my favourite costumes. This was the first year we actually rented a u-Haul to get everything from my parents’ house over to my sister’s house. It made it so much easier than taking multiple trips in different cars. And with help loading the van at the end of the night, we were able to pack it all in very quickly. Although I don’t recommend setting up a haunt of this proportion in one day. I may need several bottles of ibuprofen to survive now. There will be pictures and video of the haunt eventually. I’m not sure if they will be here on this site or on the Benevents site. So, keep checking back. I have all the footage, it’s simply a matter of gaining my sanity back before I can compile them into something nice. Not to mention I do have to work from time to time so I can pay for my obsession! Today I am simply trying to work up the energy to hit up the after Halloween sales, which is something I’ve always wanted to do, but could never get around to. Mike – Obviously this would not have gotten done without your help. Thanks for everything, including driving the u-Haul. Roger roger over and out! Mom – My spider web guru. Thanks for the webbing and thanks for sewing Mike’s cummerbund. Pops – Thanks for loading and unloading and hanging Bubbles. 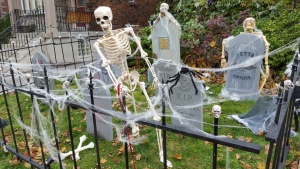 Marc – thanks for handing out candy and helping with the tear down. Thanks to the rest of the family Haberer. Thanks for letting me use your house. Thanks to Rosie for being her usual awesome self. Sam, you didn’t really do much this year and when we were running low on candy, you refused to let us steal from your haul, but I understand. You worked hard walking all those blocks. You earned those Kit Kats! And a special thanks to all the wonderful and generous people of the Pendrith neighbourhood! You are very appreciative and welcoming of Rebecca’s weird little sister and her strange hobbies. And thanks to you, we raised a nice amount of money for SickKids Foundation.